“As they traveled from town to town, they delivered the decisions reached by the apostles and elders in Jerusalem for the people to obey. So the churches were strengthened in the faith and grew daily in numbers. Paul and his companions traveled throughout the region of Phrygia and Galatia, having been kept by the Holy Spirit from preaching the word in the province of Asia. When they came to the border of Mysia, they tried to enter Bithynia, but the Spirit of Jesus would not allow them to. So they passed by Mysia and went down to Troas. During the night Paul had a vision of a man of Macedonia standing and begging him, ‘Come over to Macedonia and help us.’ After Paul had seen the vision, we got ready at once to leave for Macedonia, concluding that God had called us to preach the gospel to them” (Acts 16:4-10, NIV). In Acts chapter 16, we find the apostle Paul in the midst of a missionary journey. He is accompanied by Silas (and eventually Luke), and they are traveling through what is now known as Turkey. Ultimately, God has willed that the men end up in Philippi, which was is in the area now known as modern-day Greece, but the men at the beginning of Acts 16 are not privy to this fact yet. The power of God’s Word imputes purpose. The New Oxford American Dictionary defines purpose as “the reason for which something exists; determination.” The prophet Isaiah (43:7) already gave God’s elect their purpose: to glorify The Lord. An individual Christian’s purpose therefore becomes the specific means by which he or she will glorify God. That purpose could be to preach Christ. It could be to be a biological and spiritual mother to sons and daughters who are raised to be God-fearing men and women. It could be to evangelize. It could be to show the love and light of Christ to the disenfranchised. The point is that God’s Word tells us what our general purpose is, but we, as members of the body of Christ, will each tackle a specific task to bring glory to God. And, because our purpose is assigned by an eternal God, it always has eternal value. This is why, in my humble opinion, every Christian needs a theocentric (God-centered) mission statement for life. What specifically are you called to do to serve The Lord and bring others closer to Him? A mission statement answers this question. This statement is never created solely by you but arrived at after sincere prayer and fellowship with God. It may take a while and be difficult to formalize, but once it exists, it brings clarity and focus to your entire existence. No longer will you ever waver between opinions; rather, you will have one exclusive opinion by which you can judge life. I would dare say that Paul’s purpose was to preach and teach the truth of God’s Word. I emphasize the truth because Paul had no tolerance for anyone who deviated from the Word. The Word is what gave him strength, and he clung tightly to it throughout his life. He goes as far to say that anyone who preaches false doctrine is to be accursed (Galatians 1:9). In fact, Paul wrote much of the New Testament, where he explained to many churches behaving badly what God’s Word actually said and how they ought to straighten up accordingly. 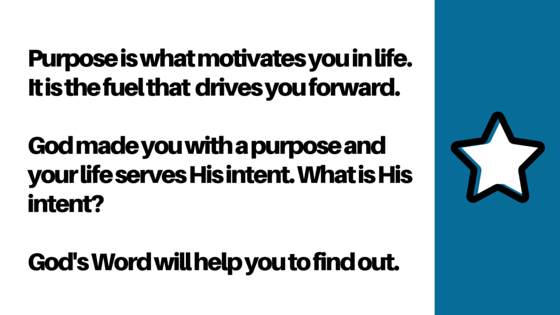 The power of God’s Word gives you purpose that makes sense of your life experiences. Paul always had a purpose, even when he was fighting against God. Here, in Acts 16, Paul is a “good guy” fighting for Christ. But, Paul used to be a bad guy. He used to be called Saul, when he was a well-renowned Pharisee, or a Jewish legalist with a fiery zeal for God’s Word. Saul was dedicated to God’s Word, but he used it as a weapon to condemn those who did not adhere to it. He also actively persecuted Christians and was instrumental in the death of the first Christian martyr, Stephen (Acts 6:8-8:1). After Saul met Christ, Saul was transformed and became Paul. Paul was dedicated to God’s Word, but instead of using it to hurt people, he used it to liberate them. Hence, Paul’s mission statement made sense of his life experiences because his training as a Pharisee actually equipped him to fulfill his life’s ultimate calling. How this applies to you today is very simple: We all serve a sovereign God, and nothing escapes His will. Everything happens for a reason, and you are by no means a “mistake” or “accidental.” Your life experiences are by no means “mistakes” or “accidental.” They all serve a purpose, and that purpose fuels your purpose. The power of God’s Word gives you purpose that cannot tolerate complacency. Acts 16:5 says, “So the churches were strengthened in the faith and grew daily in numbers.” Verse 6 says, “Paul and his companions traveled throughout the region of Phrygia and Galatia having been kept by the Holy Spirit from preaching the word in the province of Asia.” Many in church leadership today would stop after verse 5, which basically says, “Things were going well. More people were coming to church every Sunday, and the church leadership succeeded in bringing others closer to Christ.” After all, if things are going well, what reason is there to go further and to pusher harder? That reason is purpose, and purpose is allergic to complacency. This is why in verse 6, after everything was hunky-dory, Paul and Silas keep it moving because they are driven by the purpose of preaching and teaching the truth of the gospel. And, this purpose isn’t result-oriented. It’s process-oriented. Despite the fact that that the two left an area of prosperity and were “kept by the Holy Spirit” from going in a particular direction, that didn’t discourage them, because the process of spreading the gospel mattered more than the outcomes. Hence, it doesn’t matter if you fall. It matters if you get back up. It doesn’t matter if 10 or 10,000 people show up to listen to you preach. It matters that you preach sound doctrine. It doesn’t matter if you’re rejected when you evangelize. It matters that you evangelize. The power of God’s Word gives you the courage to act. The Holy Spirit regenerates us and empowers us to respond to God by faith. Faith turns us toward God, and purpose empowers us with the confidence to take the steps toward Him. Our chapter is from the Book of Acts, which is filled with acts. In other words, people were always doing something. No one in Acts ever woke up late and wondered, “What am I going to do today?” No one ever looked at the clock and wondered, “When is my shift going to be over?” No one ever asked, “How much vacation time do I get?” Everyone realized their purpose and embraced the call to serve God’s purpose and make His invisible kingdom visible. This didn’t cultivate inactivity but lit the fires of action. Internal faith is what animates external purpose. Yes, we are justified by faith alone, but that faith is never alone. Furthermore, the Book of James tells us that faith without works is dead. Otherwise, if you say you believe but don’t act on that belief, what good is that belief? Consider a Muslim, a Christian, and a Buddhist who all say they have “faith.” If none of the three act on their beliefs, how can they be correctly identified? God’s elect are all members of a chosen race, a royal priesthood, and a holy nation (I Peter 2:9). That isn’t a call to pride or self-promoting exceptionalism, but it carries with it the responsibility to act in service to God and to our neighbors. And, if you’re concerned that taking the first step is not what God wants you to do, let not your heart be troubled, because as Acts 16:6-7 reveals, no one is capable of overriding God’s sovereignty. So when we act with purpose and flirt with the boundaries of our “freedom,” He will always re-direct us. Want more? Join me next week for The Power of God’s Word: Empowerment. “Everyone who is called by My name, And whom I have created for My glory, Whom I have formed, even whom I have made” (NASB).